Earthquake Daily. Jacqueline Lyons. New Michigan Press. University of Arizona. Tucson, Arizona. 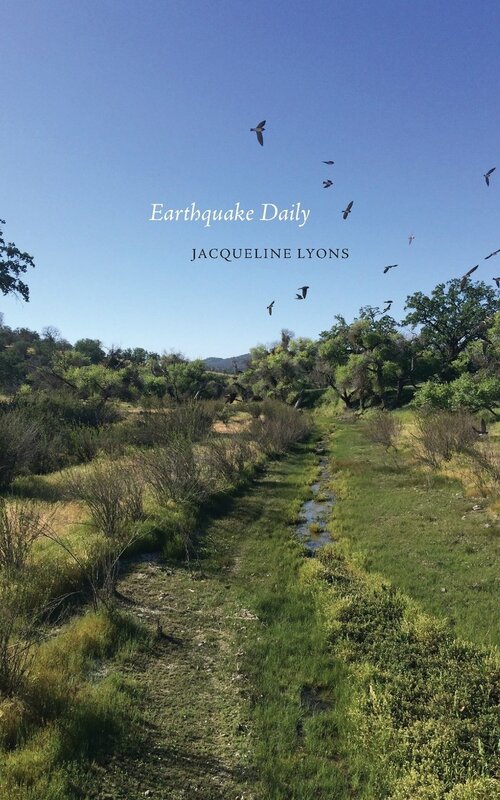 Jacqueline Lyons is trying to shake things up by tying us to an earthquake binary. Earthquake Daily isn't necessarily going for the funny bone but Lyons keeps banging that funny bone spot with a deliberate accuracy. Of course that all comes in a distant second place to the emotional fireworks Lyons exposes to the air with her calliope of chthonic wonders. The crack in the surface of things allows for Lyons to give splendid free reign to her free associations, revelations and encapsulations. Earthquake Daily is a poetry almanac, a poetry bestiary, of earth splitting reason and then the subtle undulations of Lyons' myriad mystical after-shocks. gold locks," they said "but the syllables themselves conflagrate"
the road turn to water, and the water evaporated into air. If this were batting practice; Lyons hammers another and another, and so on, solid and for distance. If this were my poetry kitchen we'd have to report that Jacqueline Lyons can burn. Earthquake Daily reads like a Tim Burton film where you don't need a glossary to understand the action but you certainly have to suspend your disbelief. Lyons is simply marvelous. Seismologists from Iceland to Ireland and all points to and fro will think of Earthquake Daily as an important new text in their lexicon. Earthquake Daily will be the new standard for all poetry measurements of seismic activity from this point on. to the past's tarnished glass. Our morning read was earth shaking. Little did we know that there was a "rumbler" flattening some ground in a lane way nearby. We assumed, for a short moment at least, and because Ottawa sits over an active center of earth shifting activity and is prone to quakes, that we were experiencing a sympathetic earthquake. Seismic poetry to be exact. Everyone on the team pitched in with enthusiasm as Lyons poetry takes everything in the world seriously while not taking itself terminally grim. Serious enjoyment is abundant on these pages. Every poem offers you price of admission returned plus a bonus. "Wake up and taste the salmon-colored sky." Jacqueline Lyons is a Hieronymus Bosch with photocopying skills. Jacqueline Lyons is a delightful Peter Bruegel the Elder. Jacqueline Lyons is a genuine earth-shaker and not even a scatalogically musing George Kennedy, and his fiercely gentle character in Cool Hand Luke, could say it truer. Jacqueline Lyons' first collection of poetry, The Way They Say Yes Here, was published by Hanging Loose Press as part of their 2003-2004 series. She has won a National Endowment for the Arts Literature Fellowship, and her work has been nominated for a Pushcart Prize. Her poems and essays have appeared in numerous journals, such as Barrow Street, Bellingham Review, Beloit Poetry Journal, Chattahoochee Review, Florida Review, Hanging Loose, Permafrost, Phoebe, Puerto del Sol, Quarter After Eight, Sonora Review, Turnrow, and others. She earned her MFA in Poetry from Colorado State University, and is currently working on a PhD in Literature and Creative Writing in Salt Lake City, Utah, where she also serves as nonfiction editor for Quarterly West. She lives on the souther segment of the San Andreas fault. "Highly inventive, these poems feel driven by emotional and cultural urgency, as earthquakes shock every part of the system, personal and collective. This is a world where the U.S. Geological Survey monitors catastrophes of mind and heart, where a quake strikes "during 47% of our waking hours when we were thinking about something other than what was actually happening." reading her poem "The Miner's Wife"